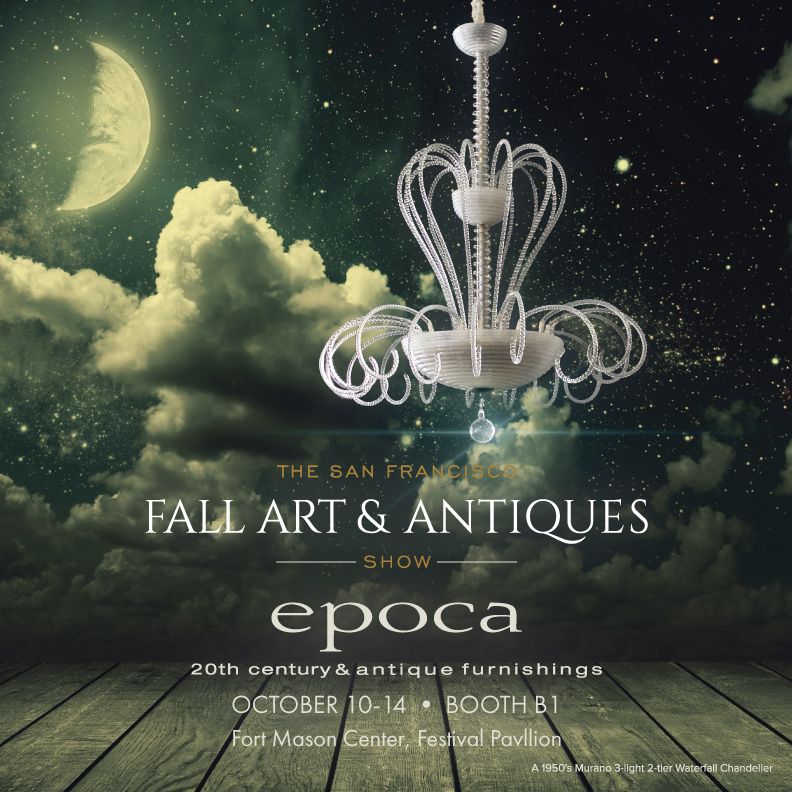 The 2018 San Francisco Fall Antiques Show! Be Our Guest: Complimentary Event Ticket courtesy of epoca! The San Francisco Fall Art & Antiques Show, now in its 37th year, is “The West Coast's oldest and most prestigious international art and antiques show,” according to Town & Country, and presents more than 50 of the finest dealers from around the world. Genres represented include furniture, modern, contemporary and fine art, objets d’art, works on paper, jewelry and precious metals, ceramics, ethnographic art and textiles. All eras are represented from antiquity through contemporary. Thousands of collectors attend over 4 days. Returning this year are the celebrated Designer Vignettes in the Grand Entry Hall, which will showcase the work of top designers in their field and incorporates pieces from our exhibiting dealers and touch on the annual show theme. Our Lecture Series sells out every year with renowned speakers talking about the history, design and importance of art, architecture, design and antiques in our culture. The 2018 Show theme is The Sun, The Moon & The Stars: Celestial Imagery in Art, Antiques & Design. Depicted by nearly every culture throughout time, celestial elements hold mystery, splendor, and symbolism. The sun is regarded as a symbol of life, power, and rebirth; the phases of the moon symbolize immortality, eternity, and purity; stars may represent the knowledge of good and truth, inspiration, imagination, dreams, and divine guidance. The sky humbles us and the celestial bodies we see from earth have long been inspiration to artists and artisans. The Opening Night Patron Receptions and Preview Gala, deemed the “the highlight of the fall season” by Haute Living attracts 2,000 patrons of the arts with tickets up to $5,000. These are serious collectors who come prepared to shop. Guests enter the Show through powerful and artfully created thematic entrance displays, created by top architects and designers. The Gala is known for its live music, caviar bars, flowing Champagne and sumptuous buffets, and the first glimpse of the best art and antiques from around the world, all available for purchase. 100% of the net proceeds from the Show support the nonprofit, Enterprise for Youth, the 49 year old nonprofit working to empower San Francisco youth to prepare for and discover career opportunities. For low income youth, this type of early access to economic opportunity is critical; helping young people find professional paths is essential to a thriving society. We will update our Fall Antiques Show page often so check back. Also visit the The San Francisco Fall Art & Antiques Show website. Watercolors by William Stanisich: an Essay by Maria Porges.